It was inevitable; the composer of "Angel of Light" and other angel-titled works sooner or later would have to give us a harp concerto. While there�s nothing here in the notes suggesting any sort of angel theme, those already fond of Einojuhani Rautavaara�s mysterious, almost celestial music of the Symphony No. 7 and other works will find much to relish about this recording. The Harp Concerto is admirably played by Marielle Nordmann, backed by the Helsinki Philharmonic and conductor Leif Segerstam. Rautavaara�s own notes to this disc tell us that, in writing the Harp Concerto for the Minnesota Orchestra, he added two harps in the orchestra, in addition to the solo harp "because I wanted to create a really full and lush harp sound when needed." Rautavaara also had two harpists review the concerto and make technical comments as he was writing it. He employs unusual harp techniques and effects such as "gushing chords" and "thunder effects." A high point of the work is in the final movement, where the three harps engage in a dialogue with the orchestra. Even more impressive, for me, is the Symphony No. 8, "The Journey" (in Finnish, �Matka�). 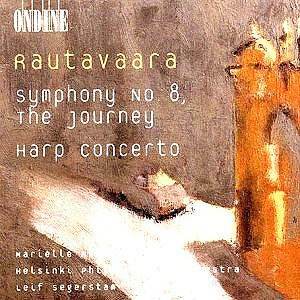 I believe I like it better than Rautavaara�s Symphony No. 7, "Angel of Light," and I like No. 7 very much indeed. Rautavaara�s notes here add a lot of value to this Ondine offering. He seems to be talking about his journey as a composer as his own view of the symphony evolved to his understanding of it, not as a form "but as a particular way of thinking in music." Here�s the composer speaking for himself: "According to Milan Kundera, symphonic music is a journey through the world, through ever-changing landscapes. It can, I think, also be a journey through human life. The title of my Eighth Symphony, The Journey, also had a concrete reason; one of the motifs in the third, slow movement is sung in one of my operas to the words �This journey goes on � whose is it? � Of one who wanders from the end of the journey? � beyond time? ��"
Metaphysical ponderings aside, this symphony, with its strong sense of nature, can also be heard as a physical journey. It gives me the sense of looking out on vast, northern fells and forests � the sort of feeling some listeners think they hear in Eduard Tubin�s Symphony No. 8. This is, after all, the composer who gave us Cantus Arcticus, a concerto for birds and orchestra set in an arctic marsh. From the brooding, low, beginning of the work, long swells of sound rise gradually. Rautavaara employs the woodwinds toward the very end of the first movement (listen at about 10.37 into the movement, and again at 11 minutes) to make something like birdcalls. It�s hard not to hear the Rautavaara of Cantus Arcticus at that point. The second movement, Feroce, is as brief as a passing storm (3.04), (suggesting to me the second movement of Rautavaara�s No. 7). It�s followed by two more long slow movements, marked Tranquillo (tense with a fragile beauty something like raindrops) and Con grandezza. It�s in this last movement that Rautavaara shows himself to be a great symphonist. It�s clear that he does indeed view the symphony as a kind of thought process, and that in this work he uses the last movement to sum up what he is saying. There�s no question that he finishes the work. And he does it with a sense of nobility and grandeur that is worth hearing again and again. For want of other touchstones, I thought of Ralph Vaughan Williams� several times in my first listening to this symphony. Part of that is the bell-like, strange opening of the last movement of No. 8, which evokes for me the first movement of the RVW No. 8. But some of the horn passages in Rautavaara also made me think of similar horn passages in RVW�s Symphony No. 5 and his Pastoral Symphony. The very bigness of the sound also made me think of Bruckner, especially in the third and fourth movements. It�s not as though the orchestra begins playing a new movement � it�s more like the shifting of continental plates. One of my surprises is in looking at the program afterward and seeing that the Symphony No. 8 fills only about 29 minutes. Rautavaara seems to have compressed time; somehow to have said something so monumental in a mere half hour. Sound is excellent. A disc well worth hearing, and having.